On Europe’s distant border, ‘The Monster of Yereven’ has escaped the asylum – and is heading for England’s shores to arrange his long-planned, Family Reunion. Whilst in solitary, the depraved mass-murderer swore vengeance against the family that betrayed him to the authorities, before fleeing for a new life, elsewhere. Alerted to The Monster’s coming, detective Jamie Carver’s task is to find the killer’s family before he does. Two problems. One, no one knows who they are. Two, he’s barred from ‘operational’ duties. But when a trail of bodies points to The Monster closing on his prey, Carver has no choice but to do what he did once before – go rogue, even if it risks destroying everything he holds dear. 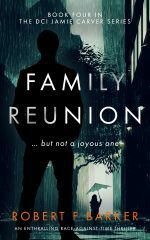 Family Reunion is a race-against-time thriller in which Jamie Carver must break through the wall of silence surrounding the illegal-immigrant community in order to save a family who don’t even know they need saving. But can he succeed against an adversary as cunning, and warped, as any he has faced before, and who always seems one step ahead?